Abstract: Objective To study the effect of PP242 on apoptosis and the expression of the apoptosis protein Bax in human lens epithelial cells(HLECs). Methods Immortal HLECs SRA01/04 were cultured and treated with different concentrations(0, 250, 500, 750, or 1 000 nmol/L) of PP242. 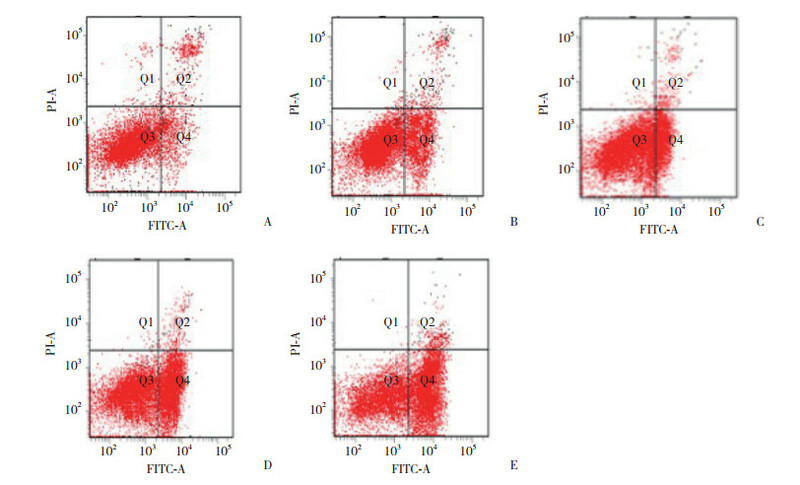 Forty-eight hours after PP242 treatment, the apoptotic rate of cells in each group was examined with flow cytometry(FCA, Annexin V + PI staining). Using reverse transcription quantitative polymerase chain reaction and Western blotting, the mRNA and protein levels of Bax were examined. Results Forty-eight hours after treatment with 250, 500, 750, or 1 000 nmol/L PP242, the apoptotic rate of HLECs was 7.20%±0.36%, 13.77%±0.21%, 16.31%±0.20%, or 18.67%±0.49%, respectively. Apoptotic rate in the control group was significantly different(P < 0.05) than that in the treatment groups. Results of the Western blotting revealed that the level of Bax was significantly increased. Further, the results of reverse-transcription quantitative PCR showed that expression of Bax mRNA increased in the treatment groups. The relative quantification of Bax mRNA was 2.157±0.125, 3.733±0.302, 5.596±0.261, 7.436±0.167. Compared with the control group, the difference was statistically significant(P < 0.05). Conclusion PP242 induces the expression of Bax and promotes apoptosis in cultured HLECs. ONO A, OIKE R, OKUHASHI Y, et al. Comparative effects of PP242 and rapamycin on mTOR signalling and NOTCH signalling in leukemia cells[J]. Anticancer Res, 2013, 33(3): 809-813. 浦利军, 杨勤. 雷帕霉素对大鼠糖尿病性白内障晶状体上皮细胞凋亡蛋白Bcl-2/Bax表达的影响[J]. 中国生化药物杂志, 2014, 34(9): 10-13. 贾松柏, 石晶明, 陈翾, 等. 紫外线对人晶状体上皮细胞凋亡的诱导剂Bcl-2, Bax基因的影响[J]. 中南大学学报, 2012, 37(7): 730-735. 刘思源, 康刚劲. 不同浓度17β-雌二醇对雌性大鼠晶状体上皮细胞凋亡的影响[J]. 眼科新进展, 2011, 31(8): 725-729.